Washington State Patrol states the wildfire started on I-90 at Milepost 81 and is estimated at eight acres. Fire resources include local Fire District and DNR personnel working on suppression and containment. A wildfire broke out on I-90 at Milepost 81 in the Cle Elum area around 1736 hours PDT this evening,prompting fire resources BATT-31 E-332 SE-426 SE-442 SE-461 SE-468 SE-SEWELL to be dispatched. 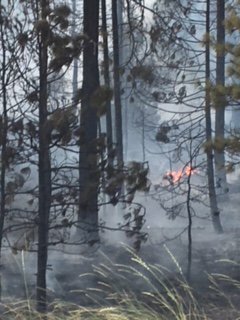 This was done through the Central Washington Interagency Communications Center who dispatched assets to the fire incident in Kittitas County located at T20N R15E S31. As of the time of this posting, there were additional assets including a Type 2, Lead and two heavy air tankers responding. Additional fire resources are responding to the scene. Division Alpha is at Milepost 81. Division Charlie has been established but we did not hear what the location was over the scanner. UPDATE | Left lane is currently open as of 1851 PDT but power lines are being threatened and if they have the possibility of falling across the lanes. They will have to shut down the road again. The fire name is officially LOWER CLE ELUM RIVER FIRE. We were also using hashtags I90 FIRE and CLE ELUM FIRE. These still may be used giving the more exact location of the incident. We are providing *Live* Fire coverage on our Twitter page @nwfireblog if you want to see what’s happening.